Years ago you could only find grits, or ground corn cooked porridge-like, in the southern United States. Luckily for us northerners, this delectable, creamy dish has become more prominent in our area. To me, grits tastes like a heavenly cross between polenta and popcorn. When cooked slowly with milk instead of water, it makes a perfect bed upon which to place your favorite breakfast food. As with other grains, cooking grits takes a bit of patience. You must bring the milk (or water) to a boil, then find the perfect simmering temperature to bring your grits to a creamy (not burnt) finish. I strongly recommend looking for traditional stone-ground grits with no additives. It may take a few minutes longer to prepare, but the natural flavors are extraordinary. Try ordering online if you can’t find these locally. My favorite purveyor is Palmetto Farms, a family-owned South Carolina tradition since the 1930s. Grits have long been considered a homey breakfast dish, but can be enjoyed for dinner, too – serve them as a simple side with a pat of butter, or spruce them up by stirring in chicken stock, cheese, fried onions, or bacon. Try the Carolina classic shrimp and grits – a mournful of creamy corn grits, topped with plump seasoned and sautéed shellfish – astoundingly easy to prepare, yet deep and rich in flavor. In this breakfast recipe, I add spunky grated cheddar to the grits as they cease simmering. Then I fry up a couple of crispy eggs to place on top, and complete with some fresh, green parsley sprigs for color and punch in my heavenly breakfast in bed. Pour milk into a medium heavy saucepan over medium heat. Bring to a boil, stirring occasionally. Stir in grits and a dash of salt. Reduce heat to simmer. Cover and cook for 15 to 20 minutes, stirring occasionally, until grits are thick and creamy. Stir in grated cheddar cheese and keep warm until ready to serve. To make eggs, heat olive oil in large, heavy frying pan over medium low heat. Crack eggs into pan one at a time, making sure to leave enough space between the eggs so the whites don’t run together. Season liberally with salt and pepper. Cook each egg until white is solid, edges are beginning to crisp and yolk is still soft, about 4 minutes. Spoon cheese grits into two bowls. Top each serving with a fried egg. Garnish with parsley and serve immediately. Happy Cephalopod Week! Let us celebrate the wise and mysterious octopus, squid, and cuttlefish with some tales of my favorite tentacled monster: the giant squid. As an avid audiobook listener, sometimes I’ll branch out and try out a book based solely on the narrator. One of my favorites is a rich-voiced Englishman named John Lee. He’s got a fantastic repertoire of voices and does gritty crime novels and humor with equal adeptness. I’ll listen to just about anything he reads. I’m pretty sure I never would have happened upon this book had it not been read by John Lee. I’d seen the name China Miéville in bookstores but never picked one up. I was surprised to discover that China is a burly bald British dude. Not that makes a difference. Kraken is a bizarre story of a man named Billy Harrow, who works for the Darwin Centre at the British Museum of Natural History. His particular specialty is the giant squid, Architeuthis dux, which he lovingly preserved himself. When the squid goes inexplicably missing, Billy is drawn into a strange underground world of a squid-worshipping cult known as the Church of Kraken Almighty. In their literature, the body of their god going missing is a harbinger of dark times, possibly the end of the world. Riddled with strange gods and magical creatures, weird unearthly villains and cops with special extra senses, this novel is super weird but oddly tantalizing. If you have a taste for the strange, or are, like me, a fan of the giant squid, give this book a whirl. Better yet, listen to John Lee’s reading and let his rich voice lull you into dreams of squid gods. Apartment bedrooms can be just as inviting as their suburban peers. Even in the coziest city flats with limited square footage and significant layout challenges, chic sleep spaces are likely. Take a look at these five stylish apartment bedrooms in San Francisco, Paris, Manhattan, Atlanta, and Sydney. 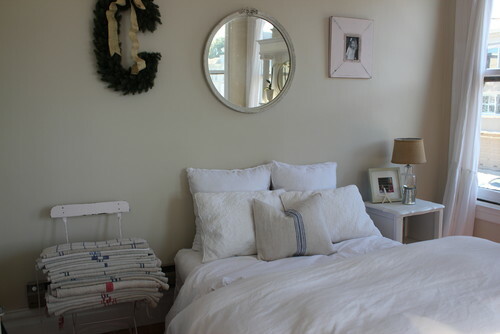 Simple is the story in this mostly white San Francisco bedroom. Designed with a full-size mattress and no headboard, the compact space boasts an uncluttered look. Handmade from 6.5 gauge linen and antique hand-loomed hemp, the bedding marries nicely with flea market finds. In this Paris bedroom decorated in the Scandinavian style, the niche acts as a headboard. 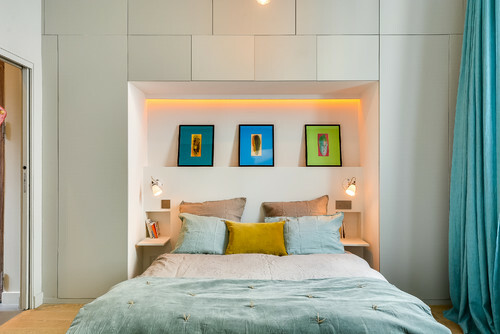 Clever lighting and nightstands complete the bed wall. Notice the tiny sconces for reading in bed. 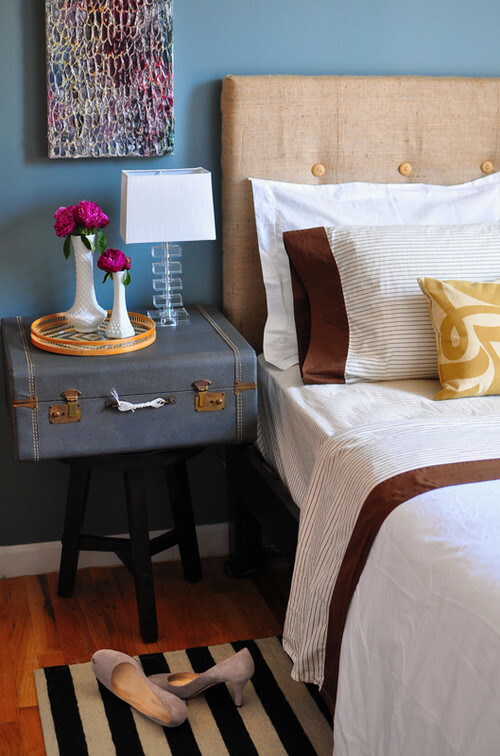 A suitcase and stool as a bedside table –– who knew? This DIY Harlem apartment bedroom exudes creativity. Not only is the nightstand outside the box, but the headboard can be made at home too. You can find instructions on Killy Scheer’s blog: Studiolo. Eclectic Bedroom by Austin Interior Designers & Decorators Scheer & Co.
You have to appreciate the chance the designer took in this Atlanta apartment. A black accent wall is not easy to pull off, particularly in a bedroom. Mixing various geometrics is no easy task, either. But somehow all of the elements, including the purple accent color, work beautifully. 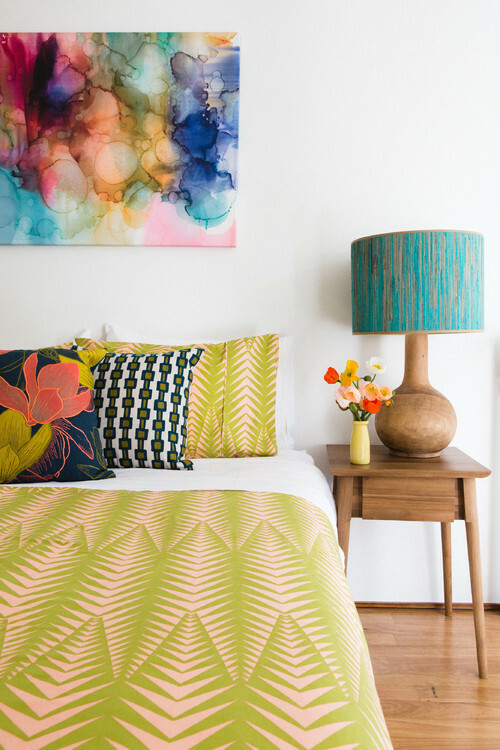 As a lover of color, I am a fan of this bedroom design in Sydney, Australia. The patterns and hues become the focal point of the bed wall. I don’t miss a headboard in this room one bit. The brights pop against the white walls. The origin of Mint Juleps is clouded with the mist of the past. We know that the drink emanated from the southern United States most likely sometime in the 18th century. The word “julep” itself is quite unusual, and is thought to have been derived from the Persian word “golâb”, meaning rose water. Made by diffusing rose petals in water, rose water has historically been used for flavoring food, scenting perfumes, supporting religious rites, and enhancing medicinal concoctions. A traditional Mint Julep is made with just four ingredients: fresh mint, sugar, bourbon and water. What began as a medical tonic to aid with “sickness at the stomach” has since morphed into a southern tradition and the signature drink of the Kentucky Derby. Approximately 120,000 Mint Juleps are sold during the race each year. The frosty thirst-quenching drinks are a surefire winner. There are as many recipes for Mint Juleps as there are drinks sold at the Derby. Some make a mint-infused simple syrup while others prefer to muddle the fresh sprigs; some use blender-crushed ice and others like large, crystal cubes; and some add the traditional bourbon, though others favor whiskey, gin, or rum. Mine is a virgin version (unless we’re having a weekend champagne brunch) which calls for fresh mango purée to be added to the mix. A very refreshing option for a sticky summer morning. Island mango and aromatic mint go together in every way – sweet counters spunky, herbal offsets fruity. Even the colors work! Rosy golden mango blush blurs and swirls with deep forest green for a winner of a breakfast in bed and a cure for what ails ya. Clean mint and trim leaves from stem. Add to a tall glass. Add sugar, and muddle together until the sugar and mint take on a pasty texture. Add mango puree and stir. Fill the glass with crushed ice, then finish with sparkling water, ginger ale, or champagne, Add a tall spoon and straw to the glass. Garnish with fresh mint leaves and serve icy chilled. Note: You can purchase mango purée, or make your own by peeling, chopping, and puréeing a fresh mango in a blender until thick and smooth. To make a traditional Mint Julep, replace the mango purée with bourbon, then add the crushed ice and fill the glass with water. Philip Pullman is a renowned children’s and young adult author. He is known most notably for the His Dark Materials trilogy: The Golden Compass; The Subtle Knife; The Amber Spyglass. These books have become lore in their own right. Now he brings us a fresh telling of his favorite fifty classic fairy tales of the brothers Grimm. We all know these fairy tales, painstakingly collected from numerous oral sources by the brothers Jacob and Wilhelm Grimm. They appear in a number of variations, from the grisly to the shiny Disney versions. Philip Pullman follows the traditional path without whitewashing the stories. But his deft knack with the pen makes these stories a little easier to read. If you’ve read fifty of the Grimm’s tales, you will know that they get pretty weird and the style of writing generally is pretty arcane. Where else will a modern translation still read: “verily, that is the way of the world”? Who says “verily” anymore? I mean, besides me. These new takes are true to the originals but with an easy to follow narrative style. This summer will be the summer of fairy tales. We have a new bean-covered tepee and a fire pit in the back yard. Every night we will sit in the firelight and read a couple stories. My son is getting the real Cinderella, which is startling in comparison to the cartoon version, as well as off-beat personal favorites such as The Mouse, the Bird and the Sausage. Fairy tales are the perfect length for bedtime reading. The long ones clock in at three to four pages so you can seem super generous by saying, “okay, just one more” two or three times. Happy fireside reading!